Shaft sinking and raising are the focus for an increasing number of equipment manufacturers. E&MJ looks at some of the newest machines and concepts. One of the most hazardous yet essential operations within mining, shaft sinking and installing raises is a highly specialized occupation. As with many other facets of the industry, the continuing trend has been toward greater mechanization and, wherever possible, the use of fewer people in high-risk positions. Sinking stages have become multilevel workplaces capable of supporting the full range of activity from shaft-bottom drilling to final lining, while the increased use of mining methods such as caving has led to a new generation of raise-drilling equipment that does away with the need for personnel access during development. 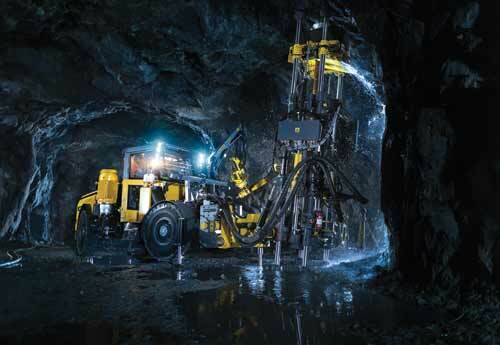 Atlas Copco’s new Easer rig, scheduled for its launch this year, drills stope-opening holes. While high-profile shaft-sinking projects remain few and far between—the shafts for Oyu Tolgoi, Jansen and Resolution spring to mind as exceptions—equipment companies have still been investing in new equipment and systems that offer the potential for faster, safer shaft construction. As far as raising is concerned, one main thrust for raise borer technology seems to have been the successful introduction of machines that have even greater capacities than before, offering existing mines the option of using this type of system not only for pilot raising, but for large diameter construction as well. With a 14 model-strong product portfolio that covers raise borers capable of handling hole diameters from 600 mm to 6 m, Atlas Copco is one of the world’s main suppliers of these machines. Its Robbins range has provided the workhorses for raise boring in both mining and construction for decades, with units at work in operations around the world. At the top end of the range in terms of their capacities, the 123RH C and 123RVF C machines are designed for a nominal 5-m raise diameter, with a maximum of 6 m. Maximum depth capabilities extend to 1,100 m.
On the other hand, sub-level and ventilation raises often need no more than a 1.2-m-diameter bore, which is where machines such as the 34RH C come into their own. Both this and the 34RH QRS are capable of reaming raises up to 610 m deep, however, and have the facility for down-reaming and box-hole drilling as well. Other variants within the portfolio include raise borers with high-torque capabilities, as well as machines for low-headroom applications. Last December, Atlas Copco announced the forthcoming launch of a new mobile rig for boring opening holes, used in mining methods such as sub-level stoping for slot development. The “Easer” can undertake both box-hole boring and down-reaming with a hole diameter of 750 mm, as well as conventional raise boring with a hole diameter of up to 1.2 m, the company said at the time. With traditional raise-boring machines typically requiring a concrete platform and tie-down bolts to keep the machine stable during operation, the total turnover time for short raises is such that the actual boring time is often below 50%, Atlas Copco noted. Being mobile, the Easer does away with the need for this type of concrete work, yet has a hole-depth capability of up to 60 m. It uses standard 200-mm drill rods with a 228-mm (9-in.) pilot drill bit. According to Atlas Copco, the Easer offers the same drilling modes as traditional raise-boring rigs: boxhole boring, down-reaming and conventional raise boring. To switch from box-hole boring to down-reaming, the gearbox is rotated 180°, a simple operation that can be carried out in an underground workshop. 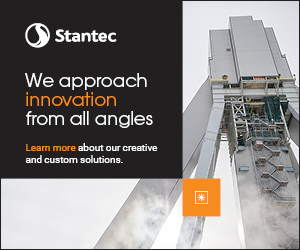 From its headquarters in Canada, Stantec is a professional services company with a focus on infrastructure, environmental and resource development projects, amongst other fields. The company’s mining section, which has a roster of some 400 people out of a worldwide total of more than 13,000, specializes in providing engineering and management services that include the delivery of shaft projects. As Stantec’s vice-president for mining for Canada, Steve Rusk, told E&MJ. “In the last few years, we have been involved in a number of projects that have included shafts,” he said, “most notably the Jansen project in Saskatchewan. Previous to that there was the Allan Underground Expansion Project, which included a shaft upgrade. In the area of raises, we did planning work for infrastructure and ventilation raises at the Diavik diamond mine in the far north of Canada, which was an interesting and challenging location with lots of water issues. “In the case of Allan, in the mid-to-late-2000s, that was an operating mine, a brownfield site, with a number of really tight constraints centered on the client not wanting to be out of production for very long. We had to be very innovative as we had to work around an existing operation. It took a lot of interaction with the client at all levels. “We designed a headframe to go over the top of an existing concrete headframe, which had a top-mounted friction hoist. We put modular steel legs over the top of it, and installed a ground-mounted friction hoist, which allowed the mine to stay in production and minimized downtime for them. Installing a new hoisting system in such a short time meant that this was a very successful project,” Rusk said. Built by the German company, Herrenknecht, the RBR 900VF is the world’s largest, most powerful raise borer. In terms of logistics for projects in remote locations, Rusk agreed this can be challenging. “The more shipping and transfer points you have to get materials to the site, the more complex it becomes,” he said. “For the Diavik project, we managed a tracking system for the underground infrastructure that followed items right through from engineering to where they are on site, ready for installation. Just as important to any raise-boring project as the machine itself, the reaming head is what bears the brunt of the work. Sandvik manufactures heads suitable for hole diameters of 0.6 m to 6 m in which all the basic components are bolted to each other, allowing fast and easy mounting, assembly and servicing. The stem is bolted to the base-head, so different sizes of stem can be fitted to suit different sizes of pilot hole. As the saddles are also bolted to the head, they are easy to reposition, giving maximum flexibility, according to the company. Larger-diameter reaming heads are available in segmented versions, making them easier to transport for projects where access is constrained. Sandvik’s product range encompasses three reamer types: the RS510 integral head, the RS520 segmented head and the RS530 extendable head. Sandvik’s product range encompasses three reamer types: the RS510 integral head, the RS520 segmented head and the RS530 extendable head. The integral type is the first choice for any project where there are no size or weight restrictions, the company said, while segmented heads are designed for projects where transport weights or dimensions are an issue. The segmented design consists of a base-head and two removable segments that can be fixed to the base-head on site, using standard tools. The extendable heads comprise a base-head with between four and six segments, enabling the reamer to be built to suit different diameters. They are then a good option for projects that have size and/or weight restrictions, as well as the need for hole-size flexibility, since the system allows raises of several different diameters to be bored with just one reaming head, thus reducing capital cost and keeping inventories to a minimum. Sandvik recently reported on the use of its raise-boring tools in a project undertaken by the Swedish contractor, Orefields, at LKAB’s Kiruna iron-ore mine. Starting in early 2012, the company bored four, 50-m-long by 2.4-m-diameter production raises over a four-month period. Operating a Rhino 1298DC machine produced by the Finnish company, TRB-Raise Borers, Orefields used Sandvik drilling tools, including stems, cutters and reamer heads. The raise borer itself, crawler-mounted and weighing 22 mt, is designed for hole diameters from 2.4 m to 3.5 m.
Shortly afterward, Orefields undertook a 3-m-diameter, 130-m-long raise at the mine, to replace a collapsed ore-pass, and has since completed a multiple-shaft contract for NCC Construction at Kiruna. Recent projects won by the Australian contracting company, Macmahon, have included several that involve raise boring and box-hole drilling. At BHP Billiton’s Olympic Dam, the company has a A$40 million contract covering the drilling of slot raises up to 150-m long, 4.5-m-diameter ventilation shafts up to 574-m long, and backfill raises. At Rio Tinto’s Argyle diamond mine, the company won a A$4 million contract to drill 143 blind box-holes, 1.1 m in diameter and 17-m long, together with some conventional raising work, while GlencoreXstrata commissioned Macmahon to drill four surface raises for the George Fisher mine expansion project. Here, the work involved blind sinking or boring at the surface, and piloting either conventionally or directionally using RDVS (Rotary Vertical Drilling System) tooling for greater accuracy. Macmahon has also bought what it claims is the world’s most powerful raise drill—the RBR 900VF made by the German company, Herrenknecht. With a continuous operating torque of 900 kNm (670,000 ft-lb) and a thrust capacity of 22,000 kN (5,000,000 lb), the machine is nearly 50% larger than any existing raise drill, according to Macmahon. Its capabilities extend to drilling 8-m-diameter raises, with raise lengths of up to 2,000 m, dependent on ground conditions. Macmahon pointed out that the rig’s design has eliminated most of the manual lifting, pushing and maneuvering needed on other machines. There is a mechanical rod-handler that enables drilling rods to be retrieved and returned to ground-located storage cassettes, with the rods themselves being made of a higher-strength steel than that currently used for raise-drill steel. In addition to its three-model raise-borer range, Herrenknecht offers two types of shaft-boring machines, a shaft-drilling jumbo and a box-hole boring machine. 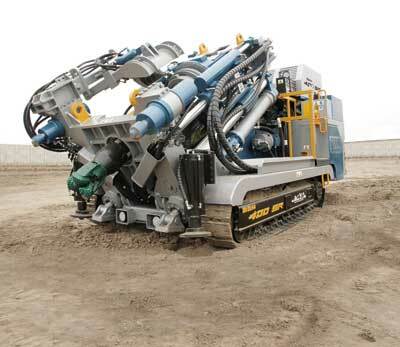 The SBM shaft borer drills up to 2,000 m into hard rock, and is capable of creating shaft diameters of 10 m–12 m. Its cutting wheel also acts as a means of removing the muck from the shaft bottom. For soft-to-medium-strength rock, the company’s SBR shaft-boring roadheader can drill to depths of 1,000 m at diameters of 8 m to 12 m. These machines use a roadheader-type boom and a pneumatic mucking system. Two of these machines, at 45-m long including all of the staging, are currently working on the shafts at BHP Billiton’s Jansen potash project in Saskatchewan. With BHP Billiton having slowed development work there, the target for shaft completion is now 2016. 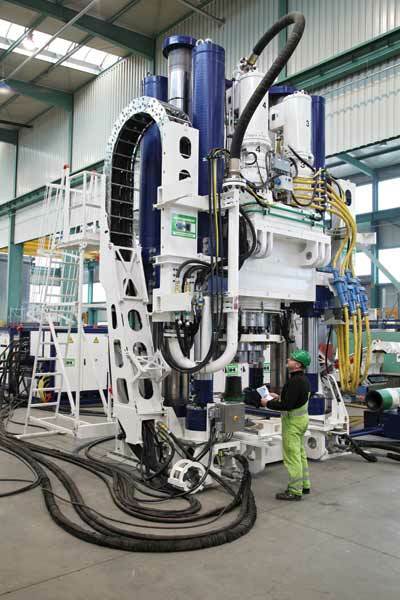 Demand from the underground mining community led Herrenknecht to develop its BBM box-hole boring machine, for which the first application was a series of box holes at Newcrest’s Cadia East mine in New South Wales. Herrenknecht reported that the machine achieved a top advance of up to 2 m/h, with a 16.5-m-long raise being completed from setup to strip-down in just 17 hours with a two-man crew. Working on the pipe-jacking principle to provide thrust to the cutter-head, the BBM1100 can drill raises up to 30-m long. Carried on a diesel-powered crawler unit, the BBM does not need a concrete pad for operation, just a level floor. The jacking frame is braced against the floor and the back to provide stability, with the setup time being as little as two hours. Having initially developed the BBM1100, Herrenknecht has followed this with the 1.5-m-diameter BBM1500, with the first two machines scheduled to have begun work on box holes at El Teniente in Chile last year. 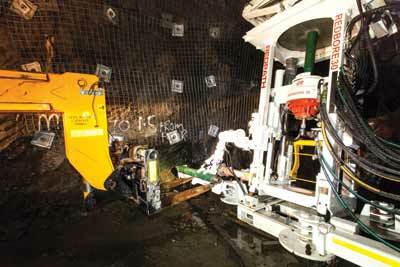 Redpath’s Redbore 30 is designed for drilling blind-hole block-caving raises. Redpath Raiseboring told E&MJ that the company has expanded its raise-borer product line significantly in recent years to include seven raise-drill series for mining—the Redbore 30, 40, 50, 50MDUR, 70, 90 and 100. Additional models are in the design and development phase, the company added. The opportunity to translate application concerns into a product or process in the shortest amount of time is a major asset, unique to Redpath’s raise-boring division, the company added. 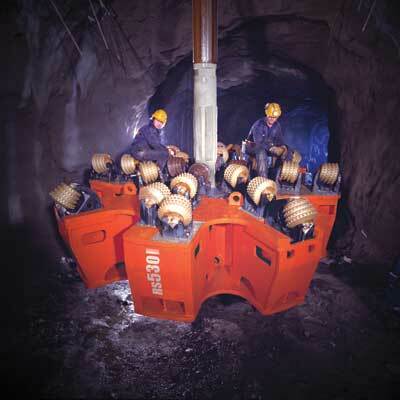 It has developed three drills specifically for use in block-cave operations: the Redbore 30, which is the newest addition for small blind-hole raises up to 1.06-m diameter in low back-height applications; the Redbore 40UR for raises to 1.2 m in diameter; and the Redbore 50 for raises to 1.5 m in diameter in low-back applications. Redpath explained that all its series of drills from the base model can be modified to each application, keeping operations, safety, spare parts and employee skills transferable around the globe. In addition, its products are supported with a range of spare parts, plus a full complement of project-support services focused on safety, risk management, project controls, training packages per drill model and commissioning personnel. Time being critical, ease of transport, quick attachments and an integral chute are becoming standard on all blind-hole units. Many site-specific options are available to shorten the setup time on all models, with the smaller series offering a padless feature. An energy-efficient power pack and drive systems make operating costs extremely attractive, when coupled with the reduced manpower for alternative types of excavations, Redpath stated. Redpath said that future trends and safety mandates make innovations and training a key component of the growth of raise drilling. 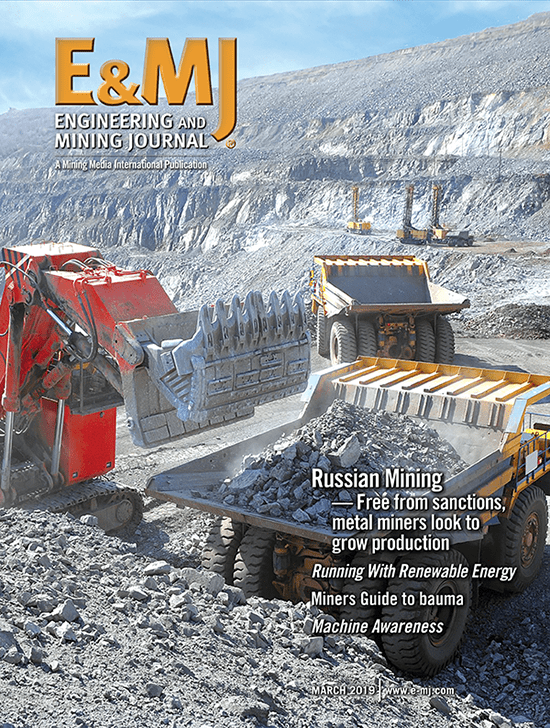 Many new mine plans are adopting mechanical rock excavation as the primary key to sustainability and future lateral development, as it is a cost-effective way to supply ventilation and access. Raiseboring’s cost-benefit and efficiency will continue to make it an attractive option to manage the excavation challenges faced by innovators in the mining industry, the company believes. Having moved its largest rig, the Redbore 100, to Australia in 2012, last year the company began a 730-m-deep, 5.5-m-diameter shaft at a mine in central Australia using the machine. By March this year, reaming had reached 380 m, Redpath’s senior vice-president, Mike Kelly, said. The operation to move the rig and all of its ancillary equipment from Perth to the mine site involved some 60 trailers, a process that will have to be repeated once this contract is finished as the rig is next scheduled to head to Zambia to drill a 700-m, 6.1-m-diameter raise for Mopani Copper Mines. Another recent entrant to the box-hole drilling sector, the Australian company Terratec, launched its UB1000 Universal Box-hole Boring Machine in the middle of last year. The machine is designed to drill boxholes up to 1.06 m in diameter and 100-m long, and can also ream conventional raises to 1.8-m diameter and 200-m deep. According to Terratec, the derrick assembly, which includes the gearbox and chuck, is suitable for 10-in.-diameter by 48-in.-long drill rods. The gearbox is designed so it can be positioned with the drive box pointing up for box holes, or down for conventional raising. The rig can operate at up to 45° dip on either side of the center-line, in a cross-drift orientation. A ground-loading rod handler is used to maneuver all drilling consumables, including the reamer and non-rotating stabilizers. Drill-rod feed cassettes that each hold 10 rods are mechanized to feed one rod at a time to the rod handler, or accept one rod at a time from the pipe loader when removing rods from the machine. Peru-based Tumi Raise Boring’s SBM-400SR, used specifically for drilling slot raises. The SBM-400SR is permanently attached to a diesel-engined crawler transporter, meaning that it can move from site to site within a mine without assistance. The carrier is also equipped with four leveling cylinders, two erecting cylinders and six pinning/stabilizing cylinders, so that the machine can be set up and stabilized without a concrete pad or the need for any bolts to anchor it. The power unit is fully integrated, with the SBM-400SR having everything needed to drill a raise within one compact package that can be transported in a standard shipping container. It is also small enough to work within a standard 3-m × 3-m drift, Blattner said. Other features that improve safety and speed include an automatic upper wrench, bottom wrench and pipe positioner, effectively eliminating human contact from the rod-change process. Blattner told E&MJ that one of these machines is now working round the clock at the Cia. Minera Milpo’s Cerro Lindo mine in Peru. The SBM-400SR can move to a worksite, pilot and ream a 25-m × 2.1-m-diameter slot raise in less than 1.5 days, he added. The company is also in the process of building two units for Chevron’s Questa moly mine in New Mexico, and is hopeful of winning a contract for a four-machine order from a major Peruvian operation. “We can confidently say that the SBM-400SR is the doorway to the future of raise boring,” Blattner said. He could indeed have a point. A number of manufacturers have added raise-drilling machines to their product portfolios in recent years, responding to increasing interest from mines around the world for a system that can be both safer and more productive than traditional raising techniques.